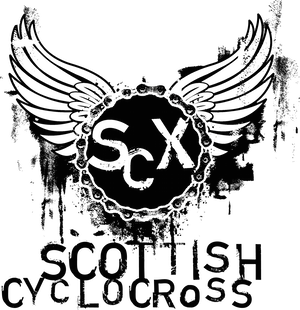 Round 7 of the Scottish Cyclocross Series returned to one of the finest ‘cross venues in Scotland, Caird Park at Dundee. And this year, promoting club Discovery Junior CC upped the ante with a new course centred on the outdoor velodrome! Riders were treated to a full circuit of the velodrome each lap, before swinging off and tackling a healthy mix of twisty woodsy singletrack, grassy off cambers and 180 turns, a log hop into a super muddy section through the woods before hitting some tough, wide heavy going grass sections, a quick trip back into the woods, some more grass then back onto the velodrome. Clever use of the grounds around the velodrome meant nearly all of the compact course could be viewed from the start/finish area – a real bonus for spectators who watched some great racing unfold across all categories. 26 riders lined up under blue skies and sunshine for 30mins plus 1 lap of racing. From the gun, Tom Arnstein was first into the turn off the track. By the middle of lap 1 a group of 5 riders had forged a small gap over the rest of the field, but entering the velodrome the lead group had shrunk to two with Stuart McClusky and Scott Lindsey setting a furious pace at the front followed by Arnstein 7 secs back. Into Lap 2 and Lindsey moved to the front, stomped hard on the pedals and opened up a small gap on McClusky. By the end of the lap, the gap to McClusky had grown to 20 secs, with Arnstein a further 15 secs back. 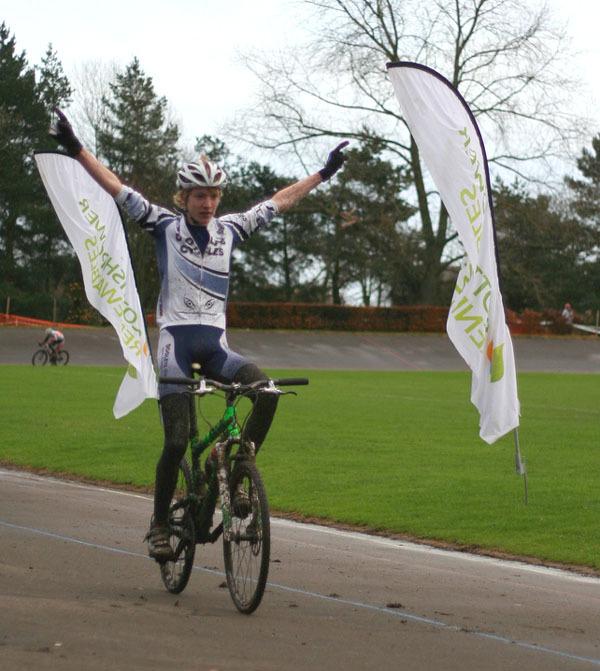 Over the final 2 laps Lindsey powered away, stretching his lead to take the win in fine style. 1 min 10 secs later, McClusky rolled across the line to take a well deserved 2nd place, just 15 secs ahead of Arnstein in 3rd. 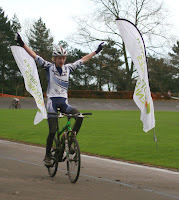 Lucy Grant rode a great race, taking 1st spot in the Girl’s race and also the win in the Youth B race. Bravo! Stuart Balfour was 2nd Youth B from Sean Noon in 3rd. Next up were the Vets, Women and Junior’s for 40mins plus 1 lap of racing. Off the start line, the field of 46 riders made for an impressive sight as they streaked around the velodrome, riders jostling for position for the holeshot into the turn off the track. Junior rider Andrew Leith got it, from Vet Gary Macrae and fellow junior Grant Ferguson. Behind a wee pile up meant the chase was on for some of the top Vet riders to get back up to the front. Mid way through Lap 1, Ferguson had moved to the front opening up a small gap on Macrae then a larger group of chasers. His lead had stretched to 10 secs coming through the start/finish, from Macrae powering round the track alone in 2nd, 12 secs up a larger group of 4 riders including Smith, James Melville and Brendan Roe. Over the next couple of laps Ferguson extended his lead out to around 20 secs and, able to hold this cushion over the remaining laps, took the race win and also 1st place in the Junior’s. Macrae closed the gap to just 10 secs at the line to take a fine 2nd place and the win in the Vets race. Melville was next home, taking 2nd spot in the Vets, just ahead of Matthew Hamilton, 2nd in the Junior’s. 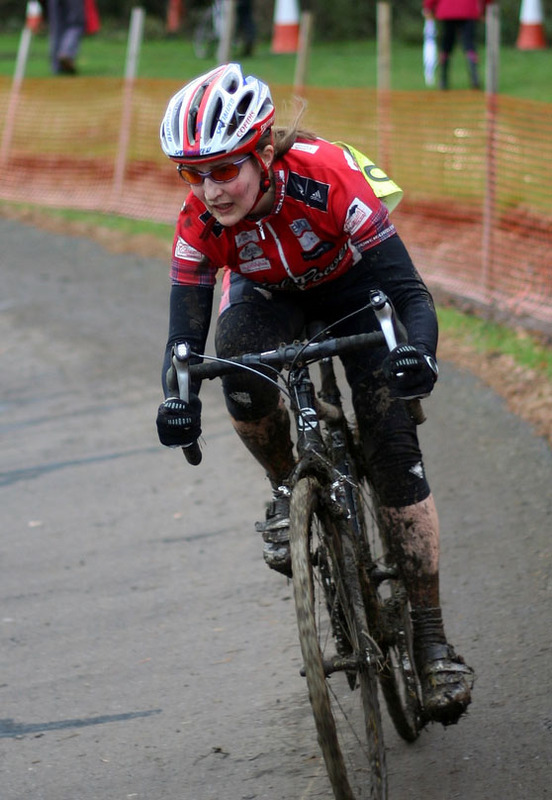 In the Women’s race, Ruth Fraser-Moodie quickly opened up a gap over the other ladies and rode on strongly to take the win in fine style, finishing on the same lap as the race winner. Behind Maddy Robinson rode in 2nd place for the first 2 laps before Gillian Palmer bridged up on Lap 3. These two would dual it out for the rest of the race, Palmer stronger on the velodrome and flat draggy grassy sections, Robinson quicker through the more technical/running sections. Into the final lap, Palmer held a slender 15 sec lead over Robinson but mid way through the lap they were back together! Palmer however was able to pull away again to take 2nd place, Robinson coming home 40 secs later for a well earned 3rd spot. The rain started to fall as the Senior’s lined up on the track for 50 mins plus 1 lap of racing. 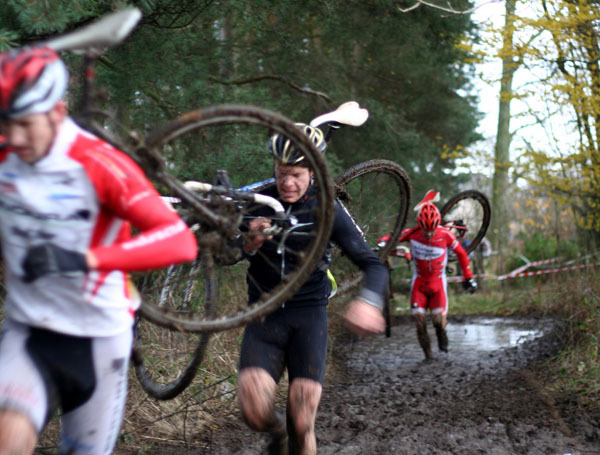 Taking pity on the riders, the organisers removed a short but now very boggy section through the trees from the course. A healthy field of 43 riders still had plenty of mud and challenging riding to look forward to though! 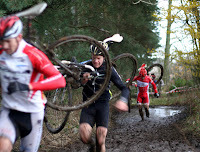 In the opening lap, Davie Lines and Craig Hardie were the first to create any significant gap, moving off the front through the now very muddy, back half of the course. By the end of the lap their lead had grown to 20 secs. Behind, sensing the gap was getting a little too big James Fraser-Moodie, Iain Nimmo and Dan Whitehead stepped things up and had bridged back up to the leaders by mid way through Lap 2. Fraser-Moodie then jumped away, followed in hot pursuit by Hardie and Whitehead. Hardie managed to bridge up to Fraser Moodie briefly but by the end of Lap 3, Fraser-Moodie had opened up an 11 sec gap over Hardie, Lines and Whitehead with Nimmo and Bruce McCleary chasing hard a further 10 secs back. Out front Fraser-Moodie continued to ride strongly and looking smooth and powerful in the mud, gradually extended his lead. Behind, the attacking began, first Hardie jumping away into sole 2nd spot, then Lines getting a gap on his chase companions during Lap 6. Lines had bridged up to Hardie by the end of Lap 7, these two just 10 secs ahead of Whitehead, Nimmo and McCleary. Next lap Hardie dropped back, leaving Lines in 2nd with Whitehead now closing quickly. Into the final lap and Fraser-Moodie held his gap to take the win comfortably. Behind, Whitehead opened up a small gap on Lines, which he just managed to hold to the line to claim a well deserved 2nd spot. Entering the velodrome for the final time, Hardie managed to outsprint McCleary and Nimmo for 4th place. 23 youngsters lined up for the Kids race. 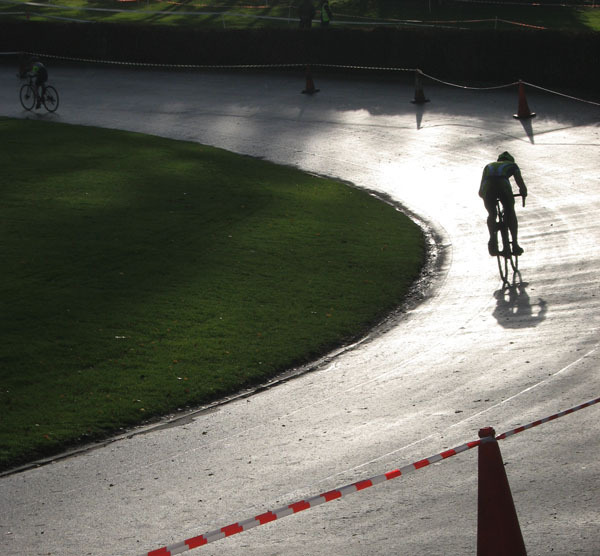 The course, a shortened version of the full circuit included part of the velodrome track, a twisty section through the trees (complete with slippy mud) and a freshly taped out section over unridden grass, to make things a little easier going. The route made for great racing and proved to be one of the best Kids courses of the series so far - technically challenging but still well within the capabilities of even the youngest riders and most importantly, a whole lot of fun! While the 20 older riders set off from the gun for a preliminary lap of the velodrome, the U8’s cut away with "a lap lead" onto the offroad section of the course. Callum Reid (Wallace Warriors) set such a fast pace that for a while it was questionable whether any of the older riders would lap him to take a genuine lead. Finton Price, following on from his U8’s win at Round 6 (Inverkeithing) managed to keep Read in his sights, but never quite closed the gap - while Mitchell Cleland worked away on a much smaller bike still, to claim 3rd. The Scottish Championships race at Glenrothes will have an U8’s silver trophy, so hopefully these younger riders will formally enter up before hand and meet again in 2 weeks time. 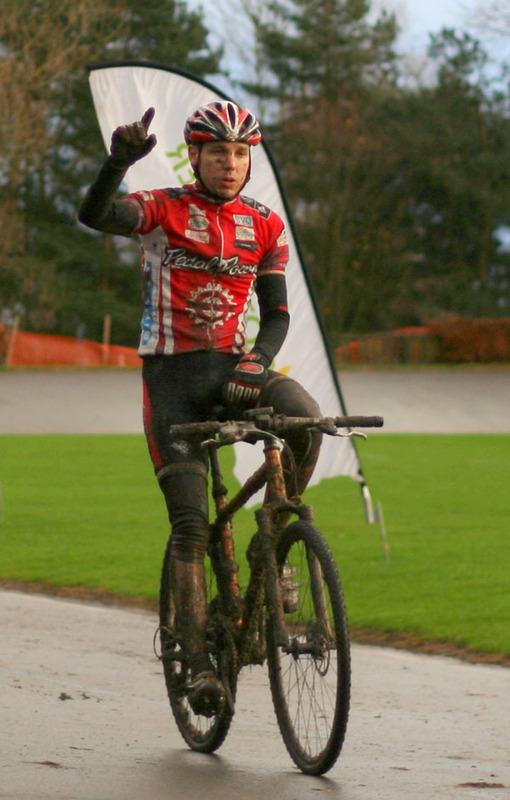 In the U10’s, series leader Cameron Mellis (Carnegie Cyclones) used the opening lap on the velodrome to power away in his neat riding style, but both Michael Hastings (Port Mor Wheelers) and Danny Mulholland (Johnstone Jets) made a race of it and Mellis didn't stretch his lead once into the technical sections. By the end of the race, and having used the home straight 4 more times, Mellis had pushed on to finish with the U12 riders. Fourteen riders in the U12’s lined up on the track for the gun, with Jamie Willoughby (Drumlanrig) taking the first bend in the lead, with Callum Grant (Peebles CC) tucked in behind. However the taller Emma Borthwick (Edinburgh RC) and Erika Allen (Wallace Warriors) kept higher on the bank and then swept down to form a tight group leaving the track and onto the offroad section. Grant managed to break away from the group, while Willoughby worked at passing Borthwick and Allen on the narrow technical sections to get into second place, while Rhona Callander (Wallace Warriors) had one of her best races to stay close in touch. By the line Grant took 1st, Willoughby 2nd, Emma Borthwick 3rd, Callum Shackely (Glasgow Riderz) a fast finishing 4th, followed by Erika Allen and Rhona Callendar - with Joe Nally (Carnegie Cyclones) being the fourth U12 boy back, and Lewis Stewart (Glasgow Riderz) just behind him. As well as excellent changing and parking facilities, the organisers also had tea and cakes available and a free soup and roll for all competitors. Everyone also received a free multi tool for their efforts. In addition, all the kids received a medal and chocolate! Well done and thank you to Martin Harris and his team from Discovery Juniors CC for putting on an absolutely superb event at a truly unique venue. Full race results are at www.scottishcyclocross.org.uk . Sue Melrose and others captured lots of great images from the race, which you can find in the Scottish Cyclocross Flickr group. Online cycling magazine CityCycling were along to report on the race. Look out for an article in their next issue which will be available on 4th December. 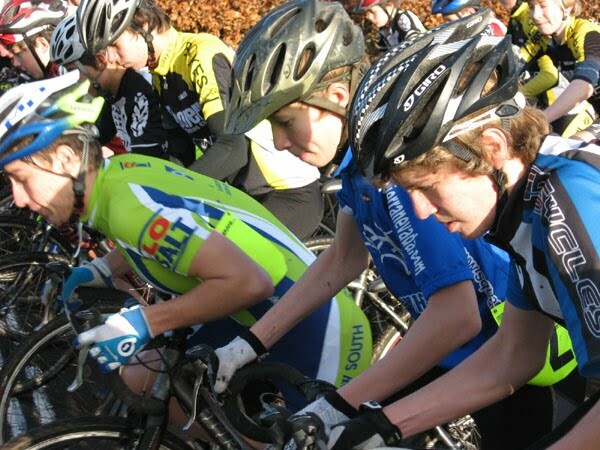 Walkers Cycling Club host Round 8 of the Scottish Cross Series at Irvine on the west coast, next Sunday, 29th Nov. The undulating course is a cracker and includes a good stretch of sand to battle through each lap!